Fig. 1. The Annunciation, 1582–1587. Oil on canvas, 13 feet 7/8 inch by 17 feet 7/8 inch. Scuola Grande di San Rocco; photograph by Adamt on Wikimedia Commons. It is a likely conjecture that Jacopo Tintoretto is nobody’s favorite painter. This is not to deny either his excellence or those many admirers who, through the centuries, have viewed his art with the fervor of partisans. But they, too, one suspects, do not love Tintoretto as others love Titian or Veronese, his great Venetian contemporaries. Even Caravaggio, for all his defiance and calculated orneriness, inspires love in a way that Tintoretto does not. Fig. 2. Portrait of a Man (possibly a self-portrait), 1550s. Oil on canvas, 19 3/8 by 14 7/8 inches. Private collection; photograph courtesy of the Metropolitan Museum of Art. Born five hundred years ago, Tintoretto did not want or need our love. He wished to extort our admiration through the raw power of his paintings rather than through the infinite human frailty of Titian or the ravishing sumptuousness of Veronese. This ambition is evident even in a small exhibition at the Metropolitan Museum, Celebrating Tintoretto: Portrait Paintings and Studio Drawings, which honors the quincentenary of Tintoretto’s birth. Although it focuses on around ten of Tintoretto’s portraits, including some figure drawings, it inevitably also provokes re-examination of those larger narrative works, mostly religious, for which the artist is best known. One of these, The Finding of Moses (Fig. 3), is included in the present exhibition, together with the portraits. Tintoretto has the curious distinction of being the only important Venetian painter of the sixteenth century actually to have been born in Venice, and he died there in 1594. In all that time, he inhabited the generally working-class sestiere of Cannaregio at the northern limit of the city. As far as we know, he left the lagoon only once, at sixty-two, when he traveled to Mantua in September of 1580. Fig. 3. The Finding of Moses, possibly 1560s. Oil on canvas, 30 ½ by 52 ¾ inches. Metropolitan Museum of Art, Gwynne Andrews Fund. Surrounded by water, Venice stood apart from the rest of Italy in its religious and social observances, its architecture, and especially its painting. And so, at a time when that wayward and elusive movement known as mannerism was conquering the rest of Italy, to say nothing of Germany and France, the Serenissima remained committed to a fairly clear-eyed view of reality, as exemplified in the work of Titian and Veronese. Tintoretto is the only important Venetian—with the occasional exception of Jacopo Bassano—to exhibit mannerist tendencies at every stage of his career. But his mannerism differs from that of his contemporaries on the mainland. They mostly rejected retinal reality in pursuit of a sinuous grace that verged on effeteness and of a palette that responded more to abstract notions of loveliness than to anything in the observable world. Tintoretto’s vision was no less eccentric than theirs, but the distortions in his work were always in the service of an explosive power that was unique among the painters of his age. Fig. 4. Miracle of the Loaves and Fishes, 1578–1581. Oil on canvas, 17 by 15 feet. Scuola Grande di San Rocco; JarektUploadBot photograph on Wikimedia Commons. In his portraits, as it happens, such mannerist tendencies are less formal than affective: a mood of flickering unease haunts these faces, which are otherwise rendered with an exacting naturalism. 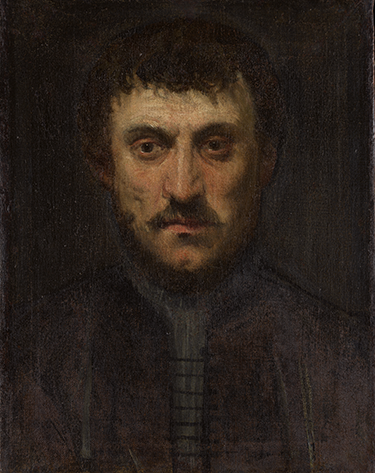 Consider one of the most striking portraits in the Met exhibition, possibly a self-portrait from about 1550, when Tintoretto was in his early thirties (Fig. 2). 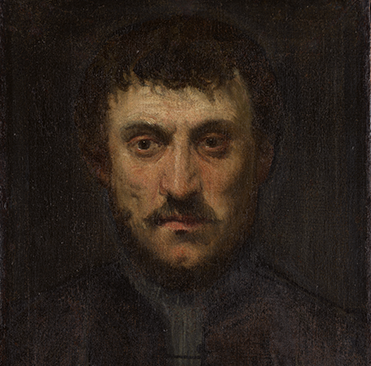 Like most of the other portraits in the show and most of the portraits that Tintoretto executed, this work is a full-frontal depiction of a head emerging from darkness into penumbral light. Its subject does not appear happy, any more than do the painter’s other sitters. Instead he looks out at us with an air of troubled, probing apprehension. Life is not good or beautiful or fine. Gone are the rich and ornamental brocades that define and enliven traditional Venetian portraiture. All those props—books, globes, and antique statues—that other painters enlisted to define the sitter and his status in the world, have been swept away like so many vanities. The shadow of Spain and the holy office falls across these tough and sullen works. Spain dominated Rome for much of the sixteenth century, enforcing the joyless Counter-Reformation mood that emanated from that city and draping half of Europe in the funereal black robes that we see in Tintoretto’s portraits. Fig. 5. 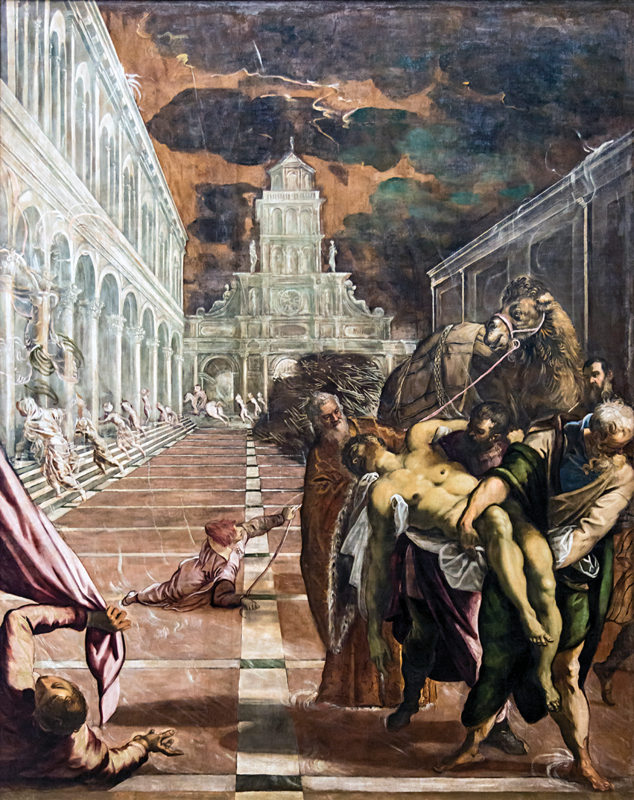 Finding of the Body of Saint Mark by Jacopo Tintoretto (1518/19–1594), 1562–1566. Oil on canvas, 13 feet by 13 feet 2 inches. Pinacoteca di Brera, Milan, Italy; Wikimedia Commons photograph. Because the Met’s diminutive exhibition commemorates the five-hundredth anniversary of Tintoretto’s birth, we should not let this occasion pass without considering those extravagantly large and ambitious canvases that were the serious business of his life, for it is surely in them that his greatness is revealed. What most struck his contemporaries—and not in a good way—was the roughness of his art. 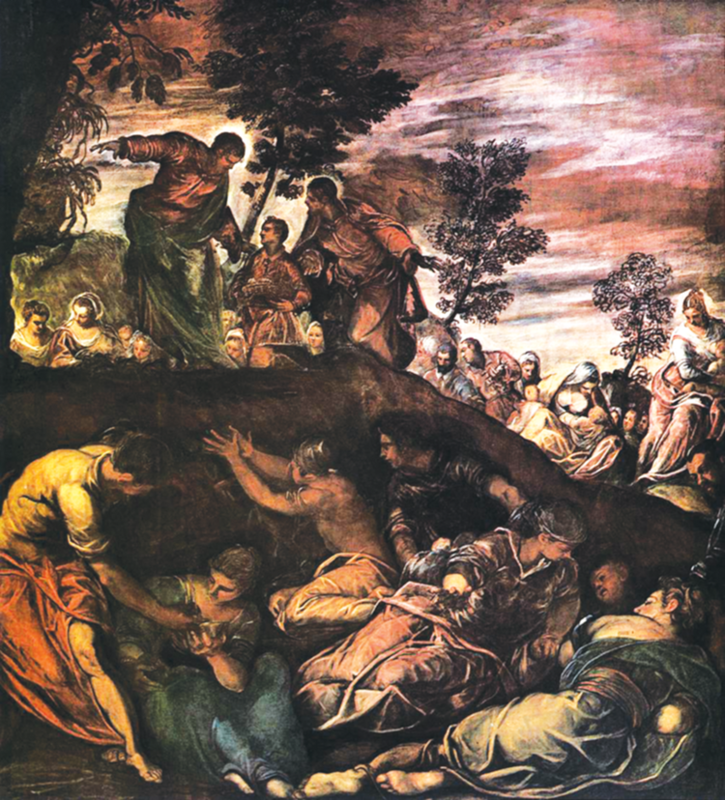 Giorgio Vasari, in the second edition of his Lives of the Artists from 1568, lamented how Tintoretto presented “as finished works sketches still so rough that the brush strokes may be seen.” Vasari is referring to a perfunctory execution that might have been tolerable in frescoes, but was unprecedented in works on canvas. 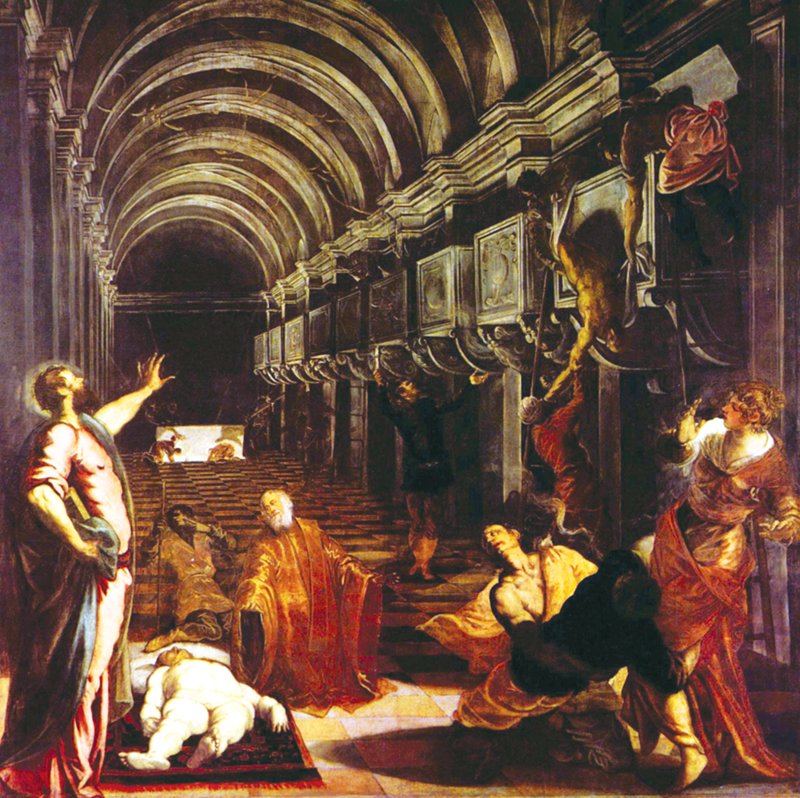 In Tintoretto’s Finding of the Body of Saint Mark (Fig. 5) in the Brera in Milan and his Removal of the Body of Saint Mark (Fig. 7) in the Gallerie dell’Accademia in Venice (both painted between 1562 and 1566), the upper portions of the canvas are filled in with a broadness of brush more characteristic of a house painter than of a fine artist. Even the figures, although more closely observed, seem almost schematic in comparison with those of Titian and Veronese. Fig. 6. The Adoration of the Shepherds, 1578–1581. Oil on canvas, 17 feet 9 inches by 15 feet. Scuola Grande di San Rocco, Venice, Italy; photograph by JarektUploadBot on Wikimedia Commons. But Vasari and his contemporaries did not understand what Tintoretto was laboring to achieve. 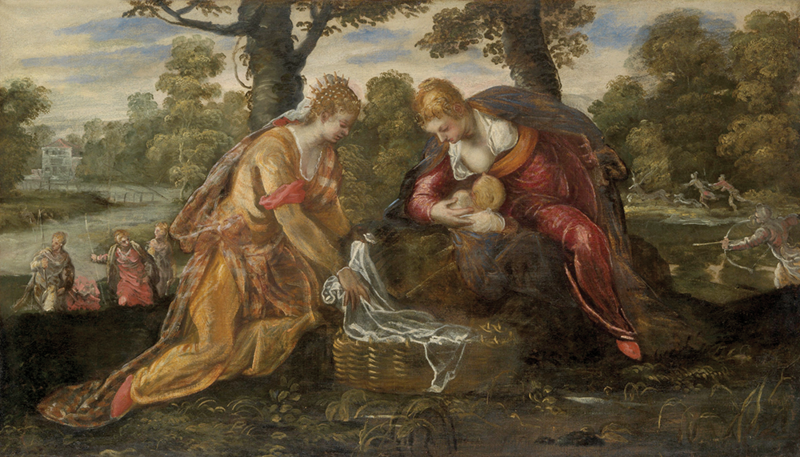 If there is one defining weakness in the works of Titian and Veronese and so many of their contemporaries, it is the fact that the figures are so faithfully rendered that—except where a painting is relatively simple in conception—they seem almost alienated from the composition in which they are placed. Tintoretto understood that in order for the complex arrangement to work artistically, the figures would have to be sacrificed to the effect of the whole: specificity could only neutralize the overall thrust of the work, which for Tintoretto was the highest aim of painting. This is to say that Tintoretto’s art was not so much that of a figure painter or a colorist as it was that of an inventor of compositions. The aesthetic consequence of this focus is usually unappreciated because the creation of them—as long as they are not obviously flawed—is rarely seen as an important part of what an old master painter did. In the case of Tintoretto, however, it is everything, and only when we take that into account do we see that he was one of the most brilliant composers of paintings in the history of Western art. The summa of these strivings are the three massive rooms of the Scuola Grande di San Rocco, for whose albergo Tintoretto conceived twenty-three paintings between 1564 and 1567, together with eight paintings for the lower floor and thirty-three for the upper floor, between 1575 and 1588. These compositions, if not the most perfect ever conceived, are the most perfect conveyances of the dramatic thrust and power of the works they inform. 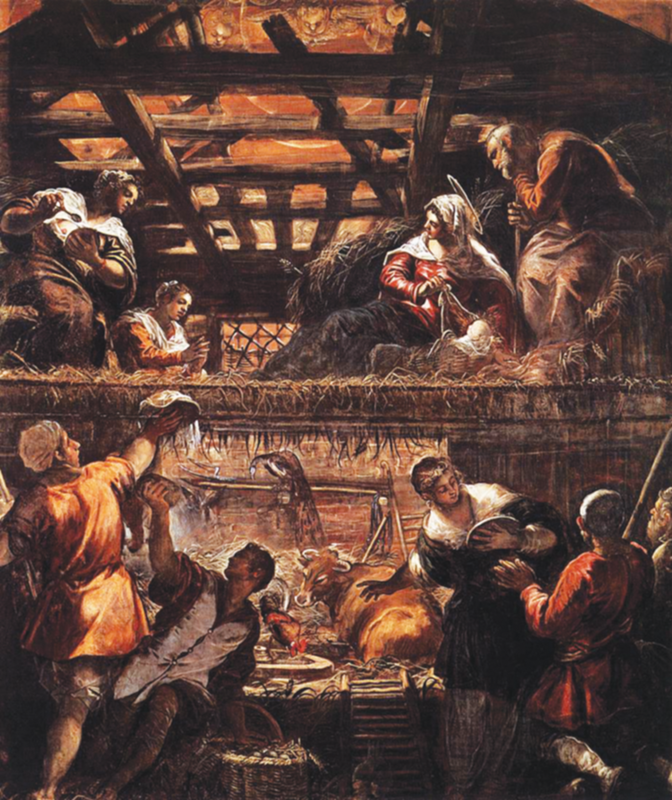 In one after another of the larger paintings in the Scuola Grande di San Rocco, Tintoretto conjures into being a work unlike any other in the previous history of Italian art. Equally as striking is the fact that, despite their brilliance, these paintings had little or no direct influence on subsequent artists, not counting a few who worked in his studio or his circle. Indeed, even the liberated spirit in which they were conceived, even the philosophy of composition that they enshrined, would never be matched by any subsequent artist. The astounding compositions that we see in The Adoration of the Shepherds (Fig. 8), The Annunciation (Fig. 9), and The Miracle of the Loaves and Fishes (Fig. 10), were used only once in Western art, and this is it, on the walls of the Scuola Grande di San Rocco. Fig. 7. Removal of the Body of Saint Mark, 1562–1566. Oil on canvas, 13 feet by 10 feet 3 inches. Gallerie dell’Accademia, Venice; photograph by Didier Descouens on Wikimedia Commons. Over the past five hundred years Tintoretto has been persistently misunderstood. If he has been admired, it has been for the manifest drama of his art. If he has been reproached, it has been for his weakness in modeling and draftsmanship on the one hand, and for his perfunctory technique on the other. Such criticism and praise are quite accurate as far as they go, but they overlook the crucial fact that there is a third component of old master painting, composition, which is almost universally overlooked. 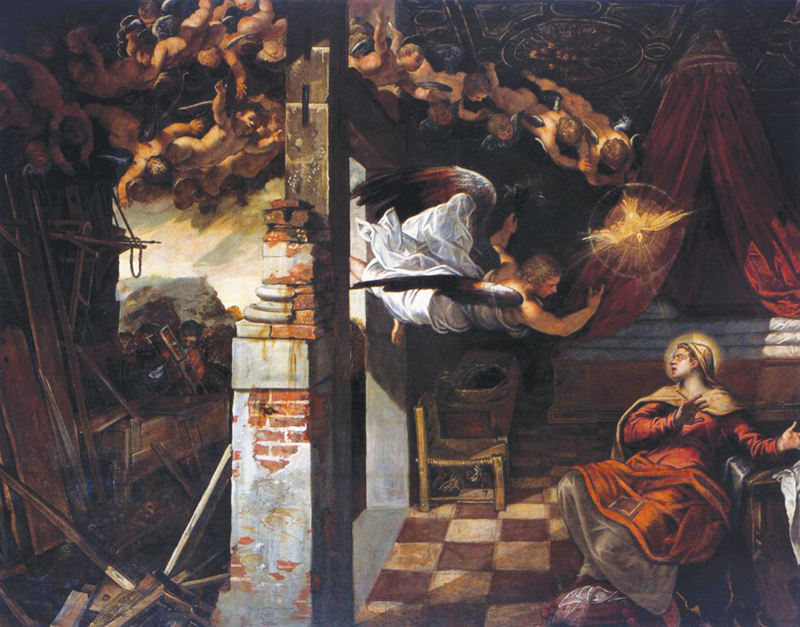 And in this regard, Tintoretto’s force has rarely been equaled and his variety never surpassed.